The World's LOUDEST Alarm Clock? Do you know someone who struggles to get out of bed in the morning? The world’s loudest alarm clock could make all the difference in the world to their morning routine. After a long, exhausting day it’s not at all uncommon to miss the alarm clock, or hit the snooze button while you’re still asleep. At Sarabec, you’ll find a range of ballistically loud alarm clocks that are perfect for those who tend to sleep in in the morning. They’re also extremely helpful for those who are hard of hearing. What is the world's loudest alarm clock? Super-loud alarm clocks aren’t just a novelty; they’re extremely effective for people with hearing issues. A range of different models are in production, some even have flashing lights and vibrating pads that slip under your mattress for full a full-sensory wake-up call! 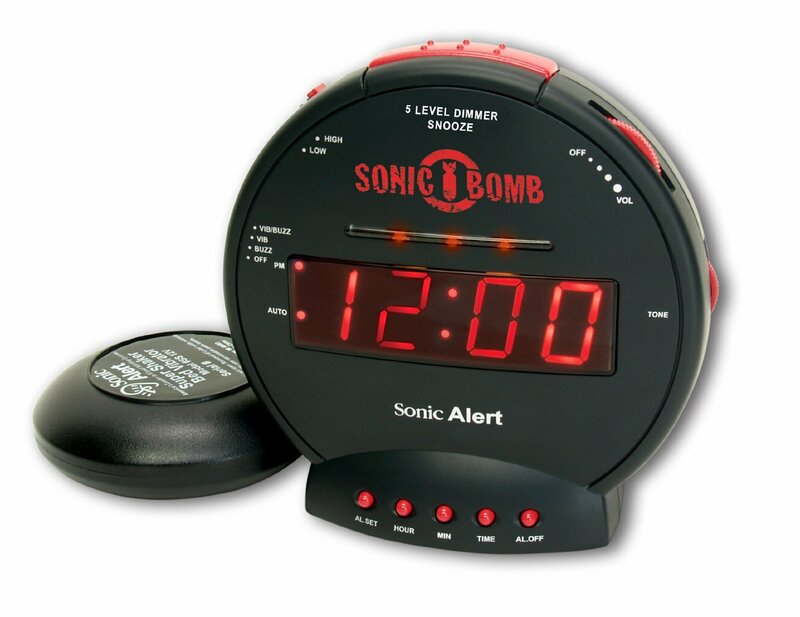 Without a doubt, the winner of ‘The World’s Loudest Alarm Clock’ title, and part of the Sarabec catalogue of loud alarm clocks, is the Sonic Bomb. It boasts an excessive alarm that can be set up to reach 113dB if necessary. Nonetheless, this is not the only feature that will ensure the user is awake. A supercharged bed shaker that can be conveniently placed under the pillow and a bright, built-in, pulsating alert light will additionally boost the alarm's effect. “My 90 year old Aunt who is deaf loves it - the vibrate bit goes under her mattress and does the job superbly! No one could sleep through that! She needed some help to set it up, but she's managing the controls fine now. She's delighted with the large display and the snooze feature. The loudest alarm clock could kick-start your day. They produce a loud abrupt sound that sends an “alarming” message to the brain, increase the adrenaline level and make us immediately alert. However, there are people such as heavy sleepers or those with hearing disabilities and the loudest alarm clock could be a valuable ally in the morning. Super loud alarm clocks are particularly useful for people with a hearing problem that have difficulty hearing the standard alarm clocks. Many loud alarm clocks are also equipped with other helpful features such as vibrating pad for use under a pillow, bright flashing lights, etc. thus catering for a full set of stimuli for waking up. For a more in-depth look at alternative alarm clock options, take a look at the full range of alarm clocks available at Sarabec.